Fans of a bizarre Easter tradition have gathered in County Durham for the 26th annual world egg-jarping championship. 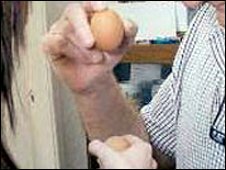 The event resembles a game of conkers, with two players crashing the pointed ends of their eggs together to see which one cracks first. Entrants in Monday's event at Helford Road Sports Club in Peterlee, submitted eggs to be hard boiled the day before, which were stamped and locked away. The winner receives £75, with proceeds going to Macmillan Cancer Support. Strict rules are in place to prevent competitors toughening the shell. Judges especially look out for eggs which have been dipped in beer, brushed with nail varnish or warmed against radiators. Jack Smedley, 81 and from Peterlee, has twice won the competition and is taking part again this year. He said: "There isn't any special skill involved. It's just a lot of fun." Organiser of the knockout competition, Roy Simpson, added: "We've been told that egg-jarping is springing up all over the world. "We've got expats from the North East organising contests in Majorca and even in Poland."